Medical plant nanas originated from Brazil. In Indonesia, nanas planted in gardens, yards, and other places that receive enough sunlight at an altitude of 1-1300 m above sea level. 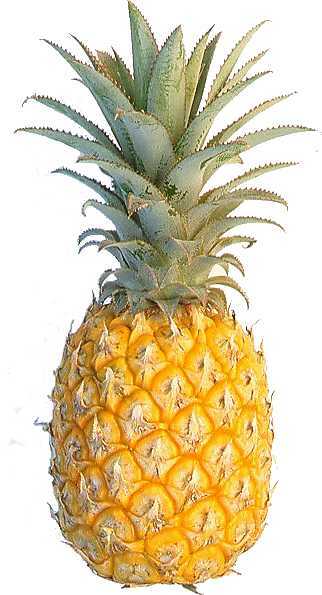 Pineapple is a fruit that is always available throughout the year. Annual or biennial herb, 50-150 cm high, there is creeping shoots at the base. Gathered in rosette leaves and roots at the base extends to the midrib. Strands of the leaf blade shape, thickness, clay, 80-120 cm, 2-6 cm wide, pointed tip resembling thorns, barbed outboard edge bent upwards, the bottom of the flaky white green, green or reddish. Compound interest are arranged in very tight grain, located terminals and long-stemmed. 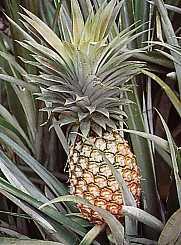 The fruit is fruit buni compound, long round, fleshy, dark green, the color becomes yellow when ripe. Fruit contains vitamins (A and C), calcium, phosphorus, magnesium, iron, sodium, potassium, dextrose, sucrose (cane sugar), and the enzyme bromelain. Bromelain efficacious anti-inflammatory, helps soften the food in the stomach, interfere with the growth of cancer sets, inhibits platelet aggregation, and has fibrinolytic activity. Fiber content may facilitate defecation in patients with constipation (constipation). The leaves contain calcium oxalate and pectic substances.